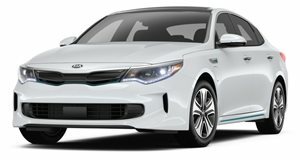 The 2017 Kia Optima plug-in hybrid is powered by a 154 hp 2.0-liter gasoline engine and a 67 hp electric motor that combine to send 202 hp and 277 lb-ft of torque to the front wheels. A 6-speed automatic transmission is standard. Performance levels are in line with the class average and an all-electric range of 29-miles is possible. The ride is comfortable although the handling levels are bettered by a number of competitors. The interior is spacious and very well-equipped with standard navigation, heated leather seats and a Harman/Kardon audio system all standard fitment. The available technology pack adds some top-level extras such as LED headlights with dynamic bending light feature, rear seat heating, rear park assist and autonomous emergency braking. 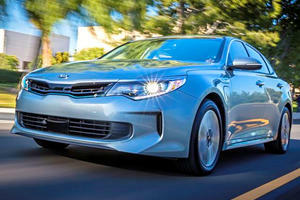 The Optima mid-sized sedan range has embraced the current hybrid technology trend and aside from the regular gas-powered model there are now hybrid and plug-in hybrid variants to choose from too. The Plug-in hybrid is new for 2017 and adds pure electric mode capability and with it the promise of much improved fuel economy figures, it does come at a price premium though. The cabin offers comfortable seating for four adults and there is plenty of space for taller passengers in the back. The quality of the materials used is only average, a lot of plastics and hard surfaces may not be out of place in the base gasoline powered Optima, but the plug-in hybrid is priced to compete with far more premium competitors where expectations are higher. The level of equipment is comprehensive however and the large touchscreen comes fitted with navigation and other features that are not standard in some competing models. Trunk space is limited due to the larger battery pack although it should still be decent enough for most shoppers needs. The additional weight of the electric motor and larger batteries does not do the Optima any favors when negotiating sharp corners at speed. The modest levels of grip are easily overcome and the floaty ride does not like bumpy road surfaces. 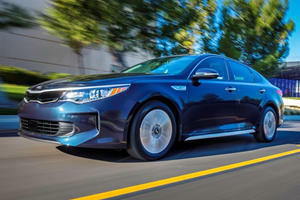 In more restrained driving situations the Optima plug-in hybrid offers quiet and unflustered progress, the automatic transmission and hybrid drivetrain unobtrusively shift between modes and ratios. Refinement levels are good too and the cabin is reasonably quiet at highway speeds. A combined output of 202 horsepower and 277 lb-ft of torque is available courtesy of a 154 hp, 139 lb-ft 2.0-liter gasoline engine and a 67 hp, 151 lb-ft electric motor. A 6-speed automatic transmission powers the front wheels. Initial acceleration is enthusiastic with the aid of the electric motor although at higher speeds the performance tends to taper off. All-electric driving is possible for up to 29 miles with a fully charged battery although any demands for quick acceleration will have the gas engine powering up to assist. The EPA figure for combined gas and electric driving is 99MPGe although once the battery pack is depleted the combined mileage is 38/43 mpg in city/highway driving. Specification levels are high and a single EX Trim level is offered which includes 17-inch alloys, auto-headlights, LED taillights, cruise control, heated and power-folding exterior mirrors, heated steering wheel and leather seats with heating for the front row and 12-way power adjustment for the driver. An 8-inch touchscreen with navigation is also included and it offers Android Auto, Apple CarPlay and Bluetooth connectivity, a rear-camera display and Harman/Kardon 10-speaker audio system complete some of the more notable specifications. There is one very comprehensive (and pricey) Technology Package that can also be specified and it adds autonomous emergency braking, adaptive cruise control, blind spot detection, rear cross-traffic alert, forward collision mitigation, rear park assist, LED headlights with dynamic bending light, panoramic sunroof and LED interior lighting. You also get ventilated front seats a 10-way power front passenger seat and heated rear seats. As with most plug-in hybrids, this Optima’s viability depends largely on the nature of your daily commute. Short trips that make the most of the electric drivetrain will yield the best results the relaxed ride quality and high specification levels are points too. Slightly sub-par interior materials and a driving experience that does not cater for enthusiasts are shortcomings that may limit its appeal, these issues may be more palatable in the less pricey hybrid Optima. Then again, a good value is a good value. First we miss out on the wagon and now this? Узнать как https://granit-sunrise.com.ua у нашего менеджера.